Way Things Are Publications, 9780983964155, 144pp. Disrupted is an exploration of the nature of the generation born during and after the great communications disruption of the last decade. Foreword by Futurist Davide Houle. It delivers strategic insights on how brands can navigate this new consumer-controlled environment. 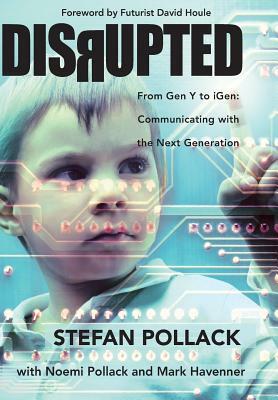 Written by tenured PR professional and president of a Los Angeles/New York PR and marketing firm, Stefan Pollack, Disrupted focuses on the iGen generation, the generation born between 1994 and 2004 (often called Gen Z). In just a few short years, iGen will be joining Gen Y as a majority among digital natives. Their existing consumer behavior represents the upcoming mainstream environment. Disrupted insists that brands need to understand how iGen communicates and change brand communication to be relevant and accessible by consumers since traditional strategies and tactics are becoming obsolete. Pollack asserts brands must gain trust with iGen by listening and becoming fluent in iGen's language and habits, conversing through two-way genuine and authentic communication, and delivering on brand promises.